Normally, you need your password to log in to your account on your Mac. You should create an admin account that you use to make changes to your Mac, such as installing new software or changing certain settings, and a user account with a different username and password for your day-to-day Mac activities. The two account names and passwords should be different. Of course, after you log in to either account, anyone can use your Mac if you walk away and don’t log out. If you leave your Mac without logging out, your Mac will either go to sleep or display a screen saver. At this time, anyone could tap the keyboard and have full access to your Mac. To avoid this problem, you can password-protect your Mac when waking up from sleep or after displaying a screen saver. For further protection, you can also password-protect your Mac from allowing an unauthorized person to make any changes to your Mac’s various System Preferences. By applying password protection to different parts of your Mac, you can increase the chances that you’ll be the only one to control your computer. If you’re the only person who has physical access to your Mac, you won’t have to worry about password protection, but if your Mac is in an area where others can access it easily, password protection can be one extra step in keeping your Mac private. Click the Security & Privacy icon to open the Security & Privacy preferences pane. 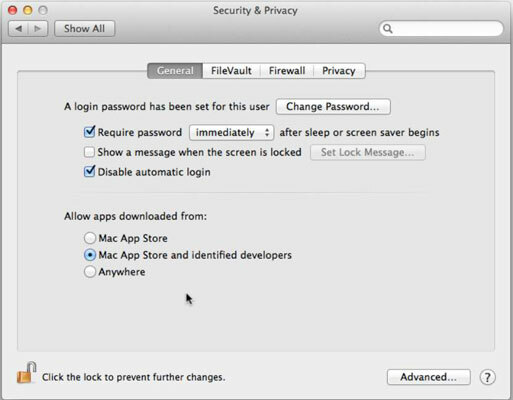 If the lock icon in the lower-left corner of the preferences window is locked, you must unlock it to make changes to your Mac’s user account details. Click the lock icon, type your password in the dialog that appears, and then press Return to unlock your Mac’s user account details. The General preferences pane appears, as shown in this figure. Select (or deselect) the Require Password<immediately>after Sleep or Screen Saver Begins check box. You can also choose to require the password at an interval between 5 seconds and 4 hours after your Mac goes to sleep. a.Select the Show a Message When the Screen Is Locked check box. b.Click the Set Lock Message button. Select (or deselect) the Disable Automatic Login check box. If this check box is selected, your Mac asks for a user name and/or password before logging in to your account. If it’s deselected, you don’t enter a password to log in. Mac App Store: Only apps from the App Store will be installed after being downloaded. Mac App Store and Identified Developers: Only apps from the App Store or signed with an Apple Developer ID will be installed after being downloaded. Anywhere: Downloads and installs any apps from any source, which opens you to risk from malware hackers. If you choose one of the first two choices and download apps from an unidentified source, when you try to install it, a warning tells you it’s from an unidentified and potentially malicious source. Control-click the app to override Gatekeeper and install the app despite the warning. Require an Administrator Password to Access System-Wide Preferences: If this check box is selected, nobody can modify your Mac’s System Preferences (such as the one you’re adjusting right now!) without the proper password. Log Out after x Minutes of Inactivity: If selected, this option logs off your account after the fixed period of time you set, so anyone trying to access your computer will need your password to log in to and access your account. Click OK after you make your choices. Click the Close button of the Security & Privacy preferences window.